Yesterday, first time in almost 2 years. You do what you have to do to survive... and what that is-- what it takes to survive, changes over time. Pleasant surprise that while Triangle, as always, gave me problems, I was able to stay in the room and didn't fall out of any poses. I was able to do toe stand, full extension of standing bow, etc. Of course, my body didm't feel "right" in some of the poses, but hey, that's why you go to yoga! Yoga alway makes me crave Indian food, a cuisine I feel ZERO mastery over. Alsam's Rasoi to the rescue! For a takeout centric get-together, I do like to pull out some homemade Lime Pickle, fry up some Pappadum and mix a pitcherful of of Gin Tonics. But this year I don't know how likely I am to make any citrus preserves: our citrus crop was damaged by frost this year (75% loss), and we are in year 3 of what's projected to be a 10 year drought (so more cold winters and difficulty recovering fro mbar years, when there are now "good" years). But, in the spirit of optimism, here's the lime pickle recipe. 1. Cut limes into 8 weeds each (leave peel on) . Place in a large bowl and sprinkle with salt. Cover and set aside in a cool dry place, stirring occasionally, for 2 days. 2. Heat oil in a medium saucepan over medium heat. Add the mustard and caraway seeds and cook for 30 seconds or until the seeds start to pop. Add the garlic, ginger, cumin, coriander and hot pepper. Cook, stirring, for about a minute, to combine and warm through. 3. Add the limes, water, sugar, vinegar. Turn heat to high. Bring combination to a boil. Reduce heat to low and simmer, stirring occasionally, for 15 minutes: mixture should be thickened. Add the mustard. I remember quite clearly the first time I visited North Africa—it was a school trip to Tunisia. But somehow I don’t remember that much novelty to the visit. Oh sure, I spent a lot of time kissing a boy I had a huge crush on, and I drank too much (there is no drinking age in Tunisia, certainly not for blonde American girls with cash in their pockets), and that was new, or new-ish, and certainly exciting. But there were also roman ruins, and franco-italian-arabic tourist dialects, and delicious bread, and the Mediterranean. The flight from Rome was only a few hours, but it seemed closer. 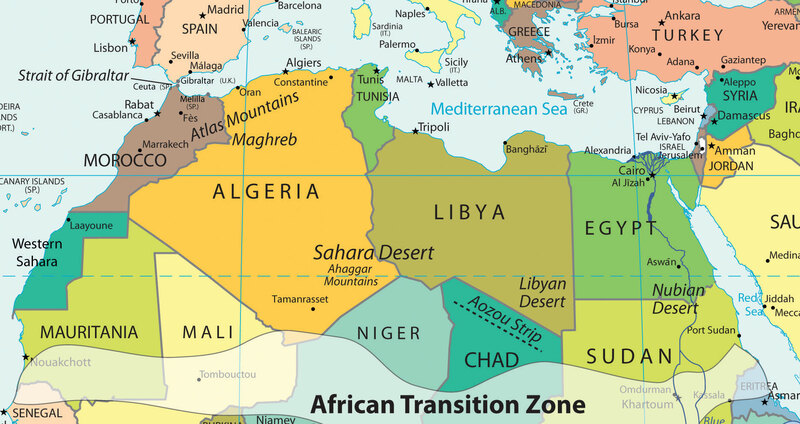 A map will show you that Italy and Morocco and Libya and Algeria and Tunisia and Egypt are 6 countries on two different continents. But I once accidentally drove into Libya from Tunisia, the (main) Prime Minister of my youth died at his home in Tunisia, and, as a child, classmates’ fathers commuted to Libya, a former colony of Italy. You could—any many have—row a boat from Kelibia to Sciacca. And in Rome it has always been possible to find delicious, authentic Tunisan couscous. My father had a fetish for the food of the Maghreb. We would eat at a Libyan-owned fish restaurant in Trastervere once a month, for Sunday lunch, after dinner, when I was a teenager. It was with my father, too, that I first visited the Couscousterie on the bad side of Testaccio. I do remember being thrilled by the idea of visiting Tunisia, I thought certainly this was one place my father hadn’t been-- I hadn’t ever heard any stories of it. And, he hadn’t been to Tunisia, but of course, I learned, he’d been to Morocco (where he slept in a bath tub in a falling down palace), and Algeria (When? Why? I’m still not sure), and he couldn’t say that he hadn’t been to Libya. For me, these were the “next countries over”, the easy exotic, like going to Mexico from the United States. The last time I was in North Africa was the summer of 2001. A few weeks after I left, there was a bombing in Casablanca. And then of course, 6 weeks later was 9/11. I never planned not to go back. But now I don’t know when I will. Not because of 9/11, but because of Benghazi. And it makes me second guess what semi-dangerous place I might ever venture into again. My first memory of awareness of terror and danger and bombing and threats is from quite a young age: I moved to Italy during Gli Anni di Piombo. There was the Red Brigade, the Mafia, and Abu Nidal. And, one day, my mother told me I couldn't ride the bus to school. Nor the next day. My mother said that the other children might be hurt if someone tried to kill me. Of course, we never used the word "kill"-- it was "death threat" or "blow [something] up". In those days the Embassy, an old Palace the U.S. had commandeered in the aftermath of the Second World War, was guarded by a long iron gate and a few marines standing duty. You showed your identity card, at the gate, perhaps explain your reason for visiting, and would then be waived across the cobblestones to the reception hall, where there was an actual appointment book, and telephones, and a switch board. It was only once inside the Embassy that your identity and appointment might actually verified, confirmed.... or refuted. After a friend died in a bombing, I asked my mother what the iron gates could do to keep us safe. She said that no one would be foolish enough to attack an embassy, or our home. My mother had took special driving classes, and always checked under the car if it had been parked outside, unattended, for a while. There were ways to walk and things to be aware of that I and my embassy friends knew form an early age. We learned Italian fluently, some Arabic, a smattering of French. We were expected to be the best and the brightest, but also to learn everything we could about where we were, to try to understand it in as many different ways as we could. And then, there was always the embassy if worse came to worst. And stick together. It wasn’t polite, or safe, to be an arrogant, ignorant, oafish, superior American alone, but together, we were invincible. And besides, only really crazy people really hated America (secretly, we all knew, we really were the best. And we could show that by being polite, respectful, and friendly). And the crazies were disorganized, young, and persuadable; ideology would burn out. A sort of lone-gunman theory of terrorism. When we came back to Italy in the late 80's, getting into the Embassy was much harder, the marines much stricter about ID. And the gate at our house had been beefed up, and there was always a car of policemen out front, and motion dictators caught me sneaking through the garden to break curfew, once I got older. And sometimes there was a helicopter overhead. I didn't really think Italy had gotten more dangerous-- if anything, it seemed safer. No more Prime Ministers being murdered, no more CIA station chiefs being kidnapped. It seemed as though the crazies had burned themselves out, and at the same time, we were being better taken care of, more protected. Safe. In retrospect, the Beirut bombings must have prompted the extra security I experienced, and American “symbolic” security actually decreased: Embassies were bombed again in 1998. But from the standpoint of today, it seems easy to dismiss those as anomalies: Osama Bin Laden was responsible for that attack, after all. If you had asked me 2 years ago what to do when travelling overseas, and cared for whatever reason, I would have said confidently, perhaps with some nostalgia, “Get to the Embassy”. I've always thought of our embassies and consulates as safe havens, and felt certain that if I went, they would take me: that they would always be my home and family. And, I imagine, the personnel-- U.S. government officers, civil servants, contractors-- who died last year in Benghazi must have thought sort of the same thing. From what I’ve read, they’ve done everything my mother always told me to do, from the best of their abilities/positions: learned Arabic, asked for help, met with the locals, grabbed a gun. To the last point: I know that when people sign up for the military or are military contractors for the CIA there is some acceptance of potential death And, certainly, the Foreign Service officers killed would have been receiving hazard pay. But, they were Americans. The best and the brightest, who had done everything right. And we are a country that famously says “no man left behind”. On the ground, support was asked for, and on the ground, Americans acted like Americans and came to help their compatriots. But no support arrived form the United States. I don't have a recipe, or a pattern, or a photo for this one. Being aware, communicating, making your own help, and then asking for more help is strength, not weakness. But what do you do when help doesn't come? 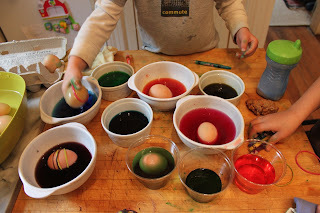 This year I tried some german organic easter egg dye along side the last of the food coloring capsules I found in the cupboard. I don't think the colors were notably different, except for a beautiful peacocky/turquoise blue we got out of the german dye. Perhaps it looked so vibrant because the blue was on the lone white egg we had. I think that is my greatest lesson learned: rubber bands, stickers, wax crayon, organic dye, food dye, homemade colors... nothing matters so much as the color of the egg, as the base you begin with.